(*) The above mentioned printing speed is the max achievable and will reduce when the vertical pad stroke is increased or when delay times have been programmed into the cycle. The maximum printing speed also depends on the parts loading device. Up to 8 movement axis easily programming. All the mechanical movements are motorized via numerical control, guarantee high precision providing complete flexibility of operation and simplicity without compromise. Its exclusive electric operation presents a considerable advantage compared to an equivalent pneumatic machine. Manufactured from light alloy and special steel. Eco-friendly. Due to its available hermetic ink system preventing solvent evaporation. Independent adjustment of speeds to each of the six strokes, ability to memorize the different and most important phases of the printing cycle. Changeover time reduced to a few minutes, thanks to the considerations given in the design concept to apply ergonomic principles to the system. Due to the mechanical design quality, a guaranteed smooth working function results in an extremely quiet action, thus allowing use in any environment. Ability to print under the printing plate, allowing decoration in every position on the large sized objects. The manufacturing it was also conceived to guarantee a long life of working without maintenance. All adjustment functions can be carried out via the numeric keyboard with alphanumeric display. Countdown function and memory of all different work programs for easy set up. Ability to print on different surface levels of the same object, adjusting easily the stroke through the keyboard. 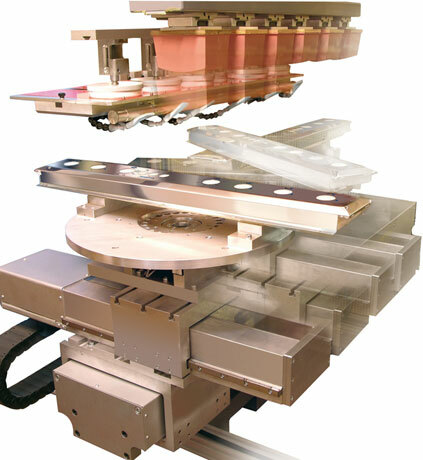 This line of machines with full electronic CNC function, is characterized by ease of management, economy and the modulation of the axes for the movement of the piece, linked to extremely rapid production changes, with a capability of nearly zeroing out set-up times of a multicolour pad printing machine. Ideal for intermittent production runs, where more than one item is worked, usually divided in lots. Thanks to the extremely contained level of investment that TOSH proposes for its medium-small models of the series, such as the Logica 02 -03 -04 -05, the user may deploy a highly technological machine in a market segment that was, until just recently, reserved only for those of a much simpler conception, with pneumatic activation. With the largest model of the line, LOGICA 08 MULTIFORMAT, an out-and-out numerically controlled pad-printing centre, TOSH has revolutionised certain sectors of application, introducing such innovations that make the LOGICA 08 MULTIFORMAT the one unit capable of truly profitable production.